SKU: PD-STAG. Categories: Pendants, Spirit Animals. Abundance. Prosperity. Virility. In addition to these powerful attributes, the stag is known for its untamable nature. 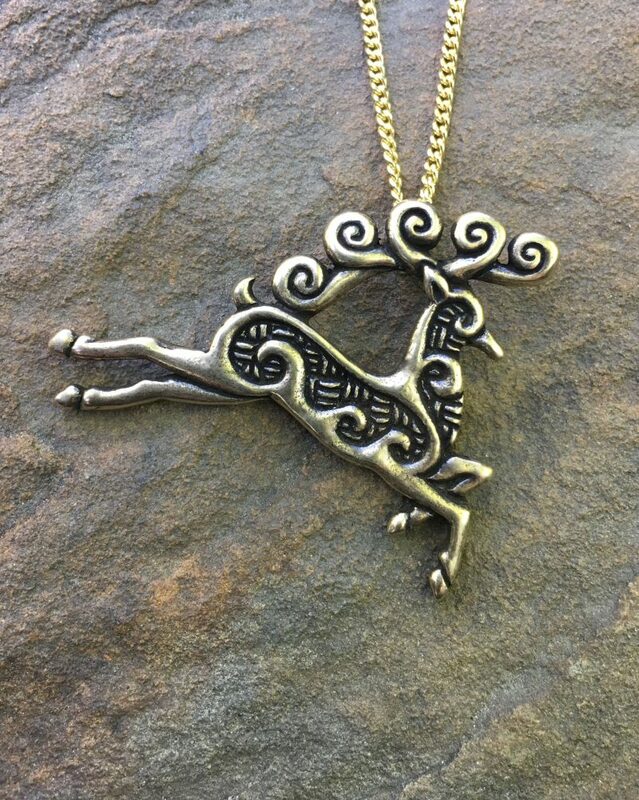 Take a walk on the wild side with our Talismanic Stag Pendant! Available in bronze and sterling silver, this pendant is 2” by 1 ¾” (50 x 44 mm) and comes with an 18” gold or silver -tone steel chain. Early hunters, intent on providing food for their tribe during the long winter months, relied on the meat of this large animal. For this reason, the stag because a symbol of abundance. But because of its wild and untamable nature, the stag was also seen as a symbol of virility and male sexuality. The stag represented the masculine side of the balance of nature and was the totem animal for the antlered deity Cernunnos (The Horned One – or Lord of all Stags), ruler and protector of water, animals and nature.